Welcome to the 2017 edition of the State of the Wraps Industry report. Once again we surveyed wraps professionals across the country to try and take the pulse of the industry, so to speak. From the responses we received it’s clear that business is becoming increasingly competitive, but at the same time there appears to be a growing customer base as the demand for wraps continues to grow. For the purpose of this survey, the wraps business is defined as a shop or individual who designs, prints and/or installs wraps or vinyl graphics. Participating shops range in size, and in how exclusively they focus their operations on wraps. This survey was sent in March/April 2017 via email to 13,903 subscribers of Sign & Digital Graphics magazine and a segment of THE SHOP magazine focused on vehicle graphics. Participating shops range in size, and in how exclusively they focus their operations on wraps. Although number of shops focusing exclusively on wraps (9%) is relatively small, it is a healthy increase over the 6.6% of wraps-only shops that reported last year. A number of shops (19%) report that 25 to 50% of their revenue comes from wraps, and the majority of shops (59%) report that up to 25% of their revenue comes from wraps. Personnel and Wages—About 40% of shops say they have one full-time installer, (down slightly from 43% in 2016)—while 20% have two on staff (up slightly from 18% last year); and 11% of shops have three or more. Outlook—Overall, survey results indicate a positive outlook for the coming year. A healthy majority of shops expect to see an increase or significant increase (79%) next year. Shops are fairly evenly split in their expectations about where those revenue-increases will come from. The largest group (46%) says increased sales will be found in partial wrap jobs (up from 35% last year), while fewer (27%) expect revenue increases from full vehicle wraps, and about 20% of shops expect increased sales in cut vinyl graphics. 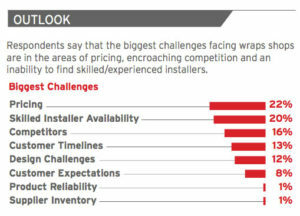 Challenges—Respondents say that the biggest challenges facing wrap shops are in the areas of pricing (22%), an inability to find skilled/experienced installers (20%), encroaching competition (16%) and meeting customer timelines (13%). This last is an increase over last year (8%) and reflects a shift in customer expectations with growing demand for quicker turnaround times. Ordering Habits— Most shops (58%) say they order wrap film more than 10 times a year, but high-volume shops can order multiple times a week. 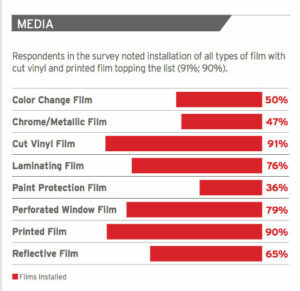 Respondents in the survey noted installation of all types of film with printed film topping the list (91%) followed by cut vinyl (90%). More than 60% of shops report being likely or very likely to try new media when it is first introduced, but more (69%) say they like to wait until the media has been on the market for a year. Most shops (86%) say they purchase at least some of their wrap tools and equipment from suppliers online. Dealer Preferences— When buying media from suppliers, shops reported that they most value suppliers that offer competitive pricing (80%), in-stock availability (68%) and good customer service (60%), all of which are up from last year. About 39% of shops value supplier location, reasonable shipping costs (42%), freshness of stock (30%) and supplier loyalty (42%). Business is good! Survey results showing a large majority of shops (84%) had some type of an increase in revenue from wraps over 2016. Many shops (45%) say that the lion’s share of their wraps revenue comes from full graphics and partial wrap jobs, with non-vehicle wrap work for commercial businesses and custom graphics following closely behind. The majority of the highest job volumes (more than 25 jobs per year) were centered on work for commercial businesses, custom graphics and fleet work. Shops reporting 5 jobs or fewer were mainly concentrated in the areas of buses and trailers, personal use and marine. And of the 84% of shops that expect sales to increase, most (94%) agree that increases will come from full wraps, partial coverage wraps and cut vinyl applications. Although we did not ask for a total number of jobs turned around in our survey, we thought it would be helpful to learn the volumes done for various types of jobs in 2016. Volumes of Jobs—The majority of the highest job volumes (more than 25 jobs per year) were centered on work for commercial businesses, custom graphics and fleet work. Shops reporting five jobs or fewer were mainly concentrated in the areas of buses and trailers, personal use and marine. Quote-to-Finish Times—Shops are becoming more efficient, it seems, as quote-to-finish times improved impressively. 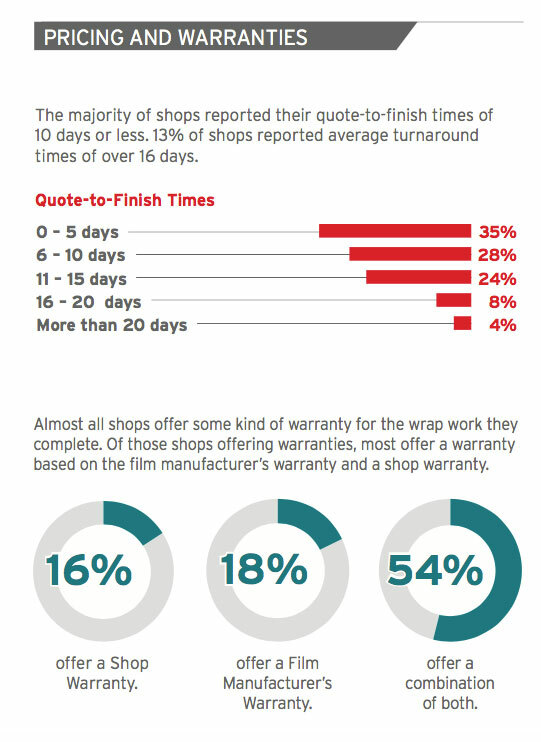 The majority of shops (63%) reported their quote-to-finish times of 10 days or less. That’s a marked improvement over last year, when only 44% of shops reported hitting that mark. About 24% of shops reported average turnaround times of 11-15 days (up from 14% last year), and only 12% of shops reported turnaround times of more than 16 days. In-house vs . Outsource— Most shops (91%) do in-house design and installations, while fewer (86%) do their own in-house printing. A good majority of shops also do in-house wrap removals (81%) and repairs (77%). And while shops tend to do most work in-house, some say they outsource their printing (14%) and installations (28%), while fewer (13%) say they outsource design work. Materials Installed—For shops doing in-house installations, most (91%) say they install cut-vinyl graphics, and more than 90% say they install printed film (up from 80% last year). Other films installed include laminating film (76%) and perforated window film (79%). And when it comes to specialty films, 47% say they install chrome/metallic films (down from 52% last year) and 50% say they install color-change films (up from 47% last year). Approximately 36% say they also install paint protection films, and 43% of shops say that in addition to wrap installations, they also offer printable magnetic media for temporary vehicle signage. Interestingly, 6% of shops reported not knowing that printable magnetic signage was an option. Wrap shop pricing differs in different geographic areas, and factors affecting prices also often depend on population densities and proximity of competition. We did not break down pricing to account for these variables, but simply wanted to offer an overview of general pricing trends. Price per Square Foot—The majority of shops report using some kind of price-per-square-foot pricing formula. Pricing from shops is trending slightly up. Many (42%) report that they charge between $11 and $15 per square foot (up from 34% last year), while the next largest group (25%) say they charge between $6 to $10 (down from 26% last year). Only 5% of shops say they are charging more than $15 per square foot, which is the same percentage as reported last year. Other Pricing Structures—A number of shops describe other pricing structures used, such as pricing specifically by the complexity of the job, charging a flat hourly shop rate, or pricing based on time and materials used. Printers and Inks—As noted above, 86% of shops do their own printing, but they are using an array of different printer types—with some shops running multiple printers. When considering a new wraps printer or printer upgrade, the two most important considerations for shop owners are color intensity (68%), followed by ink permanence and ease of maintenance (both 67%), and price (66%). About 34% of survey respondents say they plan to purchase a printer for their wraps business in 2017. The majority of shops that are printing their own wrap jobs are using printers with eco-solvent or light-solvent inks (57%), while about 23% are using printers equipped with latex inks (same as last year). Other ink types were also indicated, including true solvents (4%) and UV-curable (2%). A majority of survey respondents (76%) use a cartridge ink system for their wraps business, and 17% say they use third-party inks. Laminators—Shops responding to the survey overwhelmingly chose film lamination (90%) as their preference, and are using laminating equipment from a variety of manufacturers. Only about 7% state that they don’t laminate their work. About 25% of shops say they plan to purchase a new film laminator within the next year. Vinyl Cutters—Most shops have vinyl cutters in their shops, and 24% say they will be looking to buy or upgrade their cutter in the next year (up from 15% last year). Wrap Film—Among various categories of graphic films, more than 90% of shops say they use printed film, laminating film, cut vinyl film and perforated window film. Color-change film (50%) and specialty films such as chrome/metallic (47%) and paint protection (36%) films are less frequently used. These figures have not changed much since last year. Film Preferences—When selecting wrap media, shops say they mostly prefer films that offer air-release channels (89%), conformability (78%) and durability (74%). Other important factors include print quality (63%), price point (55%) and color fastness/fade resistance (52%). Interestingly, less than 10% of shops say that environmentally friendly films (ie. PVC-free) are of primary importance to them. Wrap Tools—Nearly all wraps businesses use a variety of different tools including top products such as squeegees (99%), cutters/knives (97%), heat guns/lamps (97%) and prep cleaners (94%). Many shops use wrap magnets (82%), knifeless tape (78%), rolling stools (78%), and body gear (50%). Other tools mentioned but not listed included rivet brushes, edge sealers, platforms/scaffolding, ladders and weed burners. 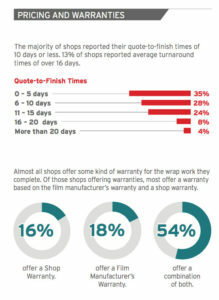 Almost all shops (88%) offer some kind of warranty for the wrap work they complete. Of those shops offering warranties, most (54%) offer a combination warranty based on the film manufacturer’s warranty and a shop warranty. About 18% of shops offer warranties offered by film manufacturers, and fewer (16%) offer only a shop warranty. Installer certifications for individuals and shops are growing in popularity, but the majority of shops (50%) say they do not use certified installers—that’s slightly down from last year when 52% of shops reported having no certifications. Certifications—for individual installers and for the shops themselves—are being earned from a range of certifying bodies currently available to the industry. It is important to note that criteria for installer certification vary greatly from certifying body to certifying body. The majority of shops report that continuing education for installers is coming from YouTube (68%), online training resources (69%), and industry trade magazines such asWRAPS magazine (49%), trade shows (44%), and apprenticeships (24%). Installer Networks—Installer networks are becoming more popular in the industry as a way for wraps installers to extend their customer reach. The report found that the majority of wraps shops (77%) do not have an affiliation with an installer network. However, about 23% of shops report that they would be likely or very likely to outsource to an installer network. Social Media Presence—Many shops looking for inexpensive ways to market themselves turn to social media outlets to establish a marketing presence on multiple forums. Nearly all shops (93%) report using social media outlets for business, and actively manage a Facebook account. Of those, more than half (56%) of respondents said that social media has led to an increase in sales over the last year. Shop Truck—Many wraps marketing experts agree that a wrapped shop truck is one of the most useful marketing tools available to a wrap shop. 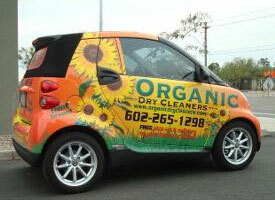 About 42% of respondents say they update the wrap on their shop vehicle at least every other year. Key findings in this report indicate that shops are doing quite well with wraps and that the industry itself is healthy and growing. By and large, shops are quite profitable and the outlook is positive. Manufacturers continue to offer viable products that shops need, and that make the wrapping process more efficient and the wraps themselves more durable. At the same time shop owners are embracing new products and are participating in continuing wraps education.